Three more people have been arrested in the Tallaght area this morning in relation to the ongoing investigation into an anti water charge protest where Tanaiste Joan Burton was trapped in her car for more than two hours. The man, woman and juvenile were being questioned at Tallaght and Terenure garda stations after being picked up shortly after 7am and can be held for up to 24 hours. This brings to 20 the numbers of men, women and juveniles picked up so far this week by gardai. Five males were arrested yesterday morning in the ongoing investigation into the protest in Jobstown last November. The three adults and two juveniles were questioned at Crumlin, Rathfarnham and Tallaght garda stations. Four men were arrested on Wednesday; two men, a juvenile male and a woman were arrested on Tuesday morning, and four men including Anti Austerity Alliance TD Paul Murphy, Councillors Mick Murphy and Kieran Mahon, and Republican activist Scott Masterson were the first to be arrested in the operation on Monday. Those arrested over the past four days were later released without charge with files being prepared for the Director of Public Prosecutions. Meanwhile Socialist TD Ruth Coppinger has defended her Dail comments labelling gardai involved in the arrest of people who took part in the controversial Jobstown protest last year as “dogs”. Last night, at a protest at the Department of Justice against this week’s arrests, she said her remarks were perhaps too “highbrow” for her Dail colleagues. Ms Coppinger is facing a Dail probe over the comments. 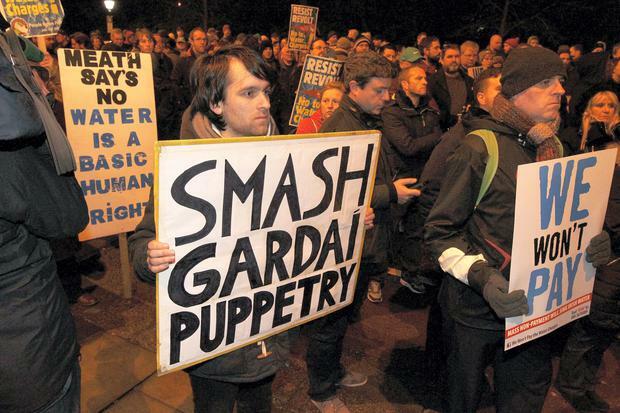 Approximately 200 demonstrators stood outside the department at St Stephen’s Green last night to protest against what is being described as “political policing”. Roads were closed to facilitate the demonstration, while Anti-Austerity Alliance (AAA) Cllr Brian Leech acted as MC. Around six gardai guarded the doors of the department while others kept watch from across the street, but the protest remained peaceful and good spirited. Ms Coppinger was yesterday accused of comparing gardai involved in the Jobstown investigation as “dogs”, sparking furious accusations from government TDs that she was showing complete disrespect to members of the force. However, Ms Coppinger defended her comments by describing them as a comparison to Shakespearean literature while suggesting that her analogy was too “highbrow” for other TDs. “Obviously, they chose to seize on the word dog as if I was targeting all of the gardai as dogs,” she said. “This detracted from the real issue which is men, women and now children being arrested by large numbers of gardai; that is the issue,” she added. Ms Coppinger also questioned Joan Burton’s “political vanity”, describing it as “fragile” and “precious” which leads her to rule a “repressive regime”.